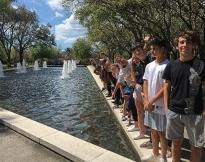 On March 8-9, our international students had the chance to visit another of Florida&apos;s top universities, the University of South Florida. The students spent time at the home of The Bulls, before heading to downtown Tampa for dinner. On the menu for the next day was a thrilling trip to Busch Gardens. Florida continues to prove an excellent "home away from home" for our international students.